This American LaFrance Type 89 pumper was purchased new by the FVFD in 1923, and was the fire motor vehicle pumper Ferndale owned. It served until 1951, when it was replaced by the Van Pelt engine. We have the original American LaFrance Proposal which does list the engine as a Type 89. We've included scans of some of the backs of the pages where there was a lot of number scratching going on, some of which are some rather large numbers that don't appear related to price. 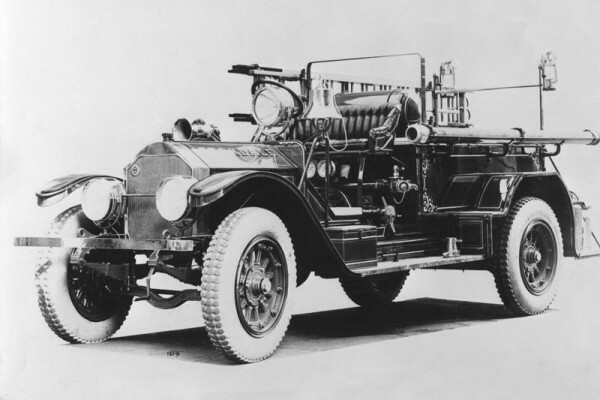 The 1923 American LaFrance Catalog doesn't show the Type 89 engine, although there are several similar models. The restoration of the 1923 was performed by FVFD volunteers, starting in March 1983 and finishing in 1985. A total of 773 hours went into the restoration. We'd like to thank the following individuals for helping preserve this wonderful fire engine for everyone in Ferndale to enjoy: Dean Petersen, Susan Petersen, Jerry Lema, Ken Laloli, Tim Cooney, Jerry Austin, Mark Denunes, Wayne Ambrosini, Jeff McDonald, Paul Sauer, Warren Longnickle, Brian Newman, Lee Tomasini, Jim Grinsell, Kevin Frey, Bill Becker, George Nicholson, Pam Lema, Wally Neibel, Larry Lema, and Tom Lema. The engine was painted by Jerry Lema, using Rinshed Mason Red Lacquer LZ1-R-106 Dezler 71698.